[MAY 4, 2001] Mary Conrady, manager of CEFCU’s Lincoln branch, agrees with other local financial institutions that the banking industry has fared well in Lincoln, and she predicts a healthy future. The credit union, which is based in Peoria, has 19 member centers within 14 counties, including Logan County, with a total of 214,000 members. Although it was originally founded, in 1937, for employees of Peoria-based Caterpillar, customers now include anyone who lives or works in one of the 14 counties served. 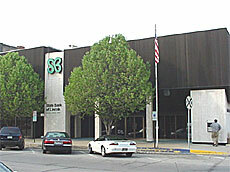 CEFCU has been operating in Lincoln since 1988, when it merged with the former Logan County employees’ credit union. Conrady said business has been good, due in part to expanded services. "The outlook is great. We are offering new products and services, and we feel we are very competitive. I see the future here in Lincoln as very bright," Conrady said. "Business is good. We had a great year last year — one of the best years in history. We diversified and we’re doing more business loans. A lot of members are business owners who wanted to have business accounts where their personal accounts area. We’re now offering a full line of business services." The credit union serves 27 businesses in Logan County with payroll deductions, a benefit for companies. Conrady said that last year CEFCU changed from a federal charter to a state charter, and business also increased due to the conversion. Serving more than 7,500 members and 57 households in Logan County, the financial institution offers savings, checking, certificates, consumer loans and mortgages, among other services. 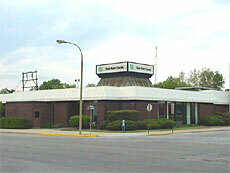 The area’s largest financial institution has current corporatewide assets, as of March 31, of $2.1 billion. Total assets in Logan County are $51 million. Savings growth increased 5.5 percent, the number of loans increased by 5.8 percent, and net worth increased 11.8 percent over the previous year, Conrady said. "We see continued growth. There’s a lot of potential for us. We have everything in place for business services, and we’re going to promote that. We want to make the community aware of what we have to offer. We are one of the few locally to offer online banking," Conrady added. Even though the agriculture industry was hit by hard times in recent years and some stores closing downtown may have signaled a troubled economy, she said her customer base is so diversified that those factors haven’t had a negative impact on her bank’s business. Even though many customers work in the agriculture industry and in local businesses, she said the bank has seen only increased business. She feels one of CEFCU’s advantages is that it’s member-owned. "The income goes back to members. Last year, we gave back a one-time special dividend of $4 million to membership corporatewide," she said. [MAY 3, 2001] Main Street Lincoln Program Manager Wendy Bell and board members Jan Schumacher and Larry Crisafulli joined more than 1,500 community leaders attending the National Town Meeting on Main Street. The April 1-4 meeting in Indianapolis was the largest annual gathering of downtown revitalization professionals in the nation. The conference brought together local Main Street program directors, board members and volunteers, as well as preservationists, city planners and economic development professionals for three days of educational activities focused on revitalizing downtowns using historic preservation. The conference featured workshops, educational sessions and inspiring speakers to inform, advise and motivate attendees. Topics included "Tourism and Retail Development," "Professional Volunteer Leadership Development," "Creating a Powerful Marketing Program" and "Heritage Tourism." Schumacher and Bell noted the heritage tourism and tourist-oriented sessions were especially timely for Main Street's involvement with the Looking for Lincoln program. It was also an opportunity for Bell, Schumacher and Crisafulli to network informally with the hundreds of other attendees from downtown revitalization programs around the country, exchanging ideas and successes. Increasingly, communities are focusing on downtowns and traditional commercial districts, as the costs of outlying homogenized development rise. Although downtowns continue to feel economic pressure from sprawl development and changes in retail trends, cities and towns are counteracting these effects through the Main Street program, which re-establishes downtowns and neighborhoods as community centers. Over the last 20 years, the Main Street program has successfully revitalized declining downtowns and has generated over $15.2 billion in community investment. Sponsored by the National Trust for Historic Preservation's Main Street Center, the Indiana Main Street Program, Historic Landmarks Foundation of Indiana and Indianapolis Downtown, the National Town Meeting focuses on the Main Street program, a highly successful strategy that blends historic preservation and economic development for downtown renewal. For more information, go to www.mainstreet.org. [MAY 3, 2001] Despite a nationally troubled agriculture economy and locally owned small businesses struggling for survival against larger conglomerates, the banking industry in Lincoln is alive and well. There are six banks in town and several banks in smaller surrounding communities in Logan County, such as Hartsburg and Atlanta. Cullen Birdsell, president of Union Planter’s Bank, said his bank has experienced an overall 8 percent increase in the past year. Although he declined to release specific figures for the Lincoln facility, he said business in the past year has been good. "We’ve had one new bank (CIB) come to town recently. Normally, you wouldn’t think a new bank would start up in a community unless they’ve done their homework and thought there was a need for it. There’s a lot of old money in Lincoln. It’s a very wealthy community and rich farmland. I think you’d be surprised at the amount (of money) in a community this size," said Birdsell. "We had a nice increase on the bottom line in the past year," he said. Union Planters, which acquired the former Magna Bank facility in 1998, is a new face in town, but has enjoyed success, despite a slowing down in recent months. "The last few months have been slower. On the commercial side, we’ve had projects that have just been shelved. Even though the interest rates have dropped, they (customers) are not sure the business climate warrants the need for expansion, and they want to wait and see what happens. We could see another six months or a year before those projects go ahead. Everyone is convinced they need to slow down," he said. "I don’t think things are nearly that bad (as some have predicted). We’ve had some large companies laying off people (nationwide), but housing is still good in Lincoln, even before rates came down. Overall, there’s been an increase in mortgage loans." Because Union Planter’s Bank is a large company, Birdsell said the bank can afford to be selective in what areas to focus on. "We are part of $34 billion holding company, so we look for niches. An independent bank has to be all things for all people. In Lincoln we’re very blessed we have a nice mix and a variety. About 48 percent of our business is commercial, about 28 percent is ag, and 24 is consumer products. That’s a nice mix to have. The county is about 35 percent ag-related, so that’s holding true for the bank," he said. "We have seen that farm prices during the last three years have not really been good for farmers, and that always brings up [the] problem of carry-over debt. We are seeing government agencies offering more assistance to farmers than in the past, and that may continue; we don’t know. The outlook, I believe, especially in this county, is that we will continue to see agriculture very much a part of our business climate." 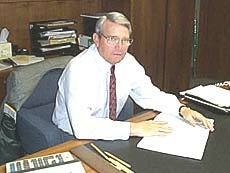 Even though the agriculture industry has been changing because of new federal programs which provide some services once offered by banks, such as operating loans and longer repayment periods, Cullen said agriculture-related business is still the largest sector of his bank’s business. "We are really the only large bank holding company in Lincoln. Our individual local loan limit is probably bigger. We can do 1½ million right here and never leave Lincoln with that, and that takes care of most of the demand here," he said. Having a diverse mix of banking options is healthy for business, he said. "I think it’s good for the consumers to have a mix. We don’t catch the hot money; we don’t need to. Margins are shrinking in banking just like they are in retail. Banking is probably seeing its biggest changes because of the shrinking margins, and you do have to find other sources of revenue. Now we’re doing payroll, brokerage services and insurance. I think that’s good for the consumers; they can get more services in one place," he said. "Lincoln has a great advantage with its location between St. Louis and Chicago and close to Springfield and Bloomington. It’s going to be a very active community." [MAY 2, 2001] Despite a nationally troubled agriculture economy and locally owned small businesses struggling for survival against larger conglomerates, the banking industry in Lincoln is alive and well. There are six banks in town and several banks in smaller surrounding communities in Logan County, such as Hartsburg and Atlanta. Brian Ash, president of Logan County Bank, the city’s other independently owned bank, also reports a healthy local economy. "We’re proud to be one of two independent banks. It’s important to a lot of people to have local control and be able to come in and talk to the people who make the decisions," he said. Logan County Bank, operating in Lincoln since 1962, enjoyed considerable growth in 1999, a 3 percent growth rate in 2000 and an even brighter outlook this year. "So far in 2001, we’ve grown as much as all of last year," Ash said. The bank’s total assets are currently $58 million, as of February. "Overall, economy is good from our bank’s perspective. We’ve had some economic setbacks with businesses closing in town, which is not a positive thing, but there’s been a lot of activity and effort going on to revitalize the downtown district, and they are trying to keep it viable," he said. "It’s a positive thing — continuing to invest in the downtown area. We think there’s a lot more potential here. I’m not alarmed by anything, we’ve had a consistent increase from three years ago." Ash also pointed to the local agriculture community as a main component of the local banking industry. "We’ve had setbacks, but that’s normal. Agriculture is one area our bank has been growing, and we see ag as a very important part of Logan County’s economy. I know ag plays a key part of business at other banks in town as well," he said. "We’re trying to become even more involved, and we’re pursuing new ag business. We’re not afraid to do business with the ag sector, in fact we’re seeking out ag business. I’m happy to say we’ve not had any unfortunate circumstances (as some communities have experienced.) It is out there, but not here. Ag is a large economic sector in Logan County and the state and is only going to continue to be viable." Despite several business closings, leaving gaps in the downtown square, Ash said his bank has seen an increase of 20 to 25 percent from last year in loans. "We’ve always been strong in residential and consumer loans, and now we’re focusing on ag to give us diversification," he said. [MAY 1, 2001] Despite a nationally troubled agriculture economy and locally owned small businesses struggling for survival against larger conglomerates, the banking industry in Lincoln is alive and well. There are six banks in town and several banks in smaller surrounding communities in Logan County, such as Hartsburg and Atlanta. "Overall, the economic climate is pretty stable here," said William M. Hull, executive vice president and trust officer of the State Bank of Lincoln. Established in 1904, the State Bank, which has four local locations, is the oldest bank in town and one of two independently owned banks. Hull said the bank’s total current assets of $154 million have remained steady with no losses in the past year. And, although some farming communities nationwide have suffered in past years, the local agriculture climate not had a negative impact on the local banking business. "We’ve seen some small businesses expanding," Hull said. "Agriculture is very important to our bank and to Logan County. We’re now looking to see what the export situation will be and what the new administration does in terms of farm programs," he said. "There were some concerns last year," about the future of the agriculture industry, but the local farming community weathered the storm. Hull said the bank has seen an increase in mortgage loans, and the real estate market has remained steady, with increased growth since the first of the year. Many customers are refinancing to take advantage of lower interest rates, while commercial loans and trusts also remain viable, he said. Despite a rich agriculture community, Hull said another reason business is good is because of the growth in Springfield and Bloomington, which is drawing new residents to the Lincoln area. "We are a little hub only 35 to 40 minutes away from those two cities. We see a lot of people who live here and work in surrounding cities like Springfield, Bloomington, Decatur and even Champaign," he said. Good health care, recreation opportunities and schools are some of the community’s drawing cards for citizens who choose to reside in Logan County. 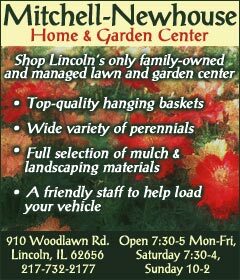 [APRIL 30, 2001] Assuming approval, Nutt plans to advertise the bachelor’s degree program to this year’s 700 to 800 graduates of Lincoln College and Heartland Community College and to workers in Bloomington/Normal. He hopes to attract 50 students to the program this fall, with an eventual goal of 100 full-time and 50 part-time students. His plan for all of Lincoln College is to stabilize at about 1,200 full-time equivalent students, including 525 residential students in Lincoln, 200 to 250 commuters and 450 full-time equivalent for all programs in Normal. He expects to reach the Lincoln goal this fall, aided by the completion of a new dormitory. Reaching the goal of 525 residential students is the culmination of the fifth year in the college’s five-year growth plan. Nutt expects that an additional dormitory planned for next year and the projected 50,000-square-foot Lincoln Center will solidify the gains in student population. The Lincoln Center will contain a gymnasium, fitness center open to the public, museum, rare-book room, Logan County Hall of Fame and the relocated Hall of Presidents. Nutt also hopes to establish a Hall of Governors, with signatures of all Illinois governors, patterned after the presidential signature display now in McKinstry Library. He said the process of developing the bachelor’s program began in 1995 when Heartland Community College officially opened and enrollment at Lincoln College in Normal began to decline. In an effort to develop "a symbiotic, not an adversarial relationship," he said, Lincoln College began building housing to differentiate itself from its all-commuter neighbor on Raab Road. When three housing units were in place, enrollment stabilized and began to climb. Acquisition of Midwest College of Cosmetology three years ago added the equivalent of 100 full-time students per year. Building plans for the Normal campus include an addition to the cosmetology school and more housing. Planning began in earnest when Lincoln College employed Educational Alliance, a higher-education consulting firm located in Boston, to explore the feasibility of a baccalaureate program. Focus groups were conducted among students, alumni, business leaders and other affected groups in Bloomington/Normal. The North Central Association was also consulted, and a curriculum committee has been meeting for 15 months to establish course requirements. In addition to Fansler, two faculty members have been hired specifically for the bachelor’s program: Dr. Debora Van Hoorn in language and humanities and Dr. Dana Farnham in anthropology. Faculty members already teaching on the Lincoln and Normal campuses will conduct the remainder of the new courses. "People come to Lincoln College because we are a two-year school," said Nutt. "Now another bridge will be available to them." Among potential students he counts graduates of Illinois Central College in Peoria, Parkland Community College in Champaign/Urbana and the nearly three-quarters of the population of McLean County with less than a bachelor’s degree. However, he expects the majority of students to be associate’s degree graduates of Lincoln College. He notes that in the last 20 years three-fourths of the private two-year colleges in the United States have folded. Lincoln College, by contrast, has experienced five years of growth. Assuming approval by the North Central Association, he expects the two-plus-two program to continue that growth. The college was founded as Lincoln University, a four-year school, but the program was reduced to two years in 1929, when enrollment dropped as a result of the threatening Depression. In a way the school has come full circle. 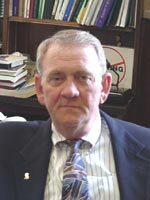 [APRIL 30, 2001] The Illinois Coalition for Responsible Tobacco Retailing announces training seminars in Peoria, Rosemont, Rockford, Rock Island, Decatur and Springfield. The Illinois Retail Merchants Association, Illinois Petroleum Marketers Association, Illinois Food Retailers Association and the Illinois Licensed Beverage Association have joined the "Under 18, No Tobacco: We Card" program to co-sponsor the FREE seminars. The Springfield and Decatur sessions will be Thursday, May 17. It is illegal to sell tobacco to anyone under age 18, and there are stiff fines and penalties for retailers who violate the law. A reported 18,000 compliance checks will be conducted by enforcement authorities in Illinois this year. Businesses are urged to be prepared and in full compliance. The training seminars and "We Card" training materials will give store managers and employees the tools needed to help uphold all minimum-age tobacco sales laws. The sessions and all materials are completely FREE. Participants will receive free "Under 18, No Tobacco: We Card" signage, employee pins and other tools to display in their stores, in addition to training workbooks and study guides. Refreshments will be provided. Call (888) 872-4603 to reserve space for you and your employees. This is an opportunity to make a difference in a very important issue. Thursday, May 17, 9 to 11 a.m.
Thursday, May 17, 3 to 5 p.m.
[APRIL 28, 2001] If approved by the regional accrediting association, Lincoln College will begin offering courses this fall leading to a bachelor’s degree in liberal arts. The program will be offered on the Normal campus only. LC President Jack Nutt said the program, which has been in the planning stages for several years, meets the needs of both two-year graduates who want to complete their studies near home and working adults whose education was interrupted. "Although some junior colleges try to expand out of a sense of panic in order to survive," he said, "that is not true here. Instead, institutional research has identified a local need that will sustain the program." To define the program for presentation to the North Central Association, the regional accrediting association, the college published a 114-page institutional change report in January. It outlines a two-plus-two program, meaning two years leading to an Associate of Arts degree, until now the entire mission of the college, and a separate enrollment and two-year program leading to a bachelor’s degree. The report defines two new programs, a Bachelor of Arts in Liberal Arts and a Bachelor of Science in Business Management. However, the plan is to offer only the liberal arts program for at least a year. A two-person North Central accreditation team reviewed the programs April 23-24. They unanimously recommended approval of both degrees, in liberal arts and business management, and the college anticipates favorable action by the commission when it meets on June 18. As part of the research justifying the program, Lincoln College conducted focus-group discussions with major employers in Bloomington-Normal, such as State Farm Insurance. According to Nutt, these employers said they want liberally educated employees whom they can then train to meet the needs of the particular position. Nutt said he envisions a hands-on program. Although students will not concentrate in a traditional major, in their final semester they will apply their skills in a specific job situation. The school will require a minimum of 10 hours’ work off-campus per week as part of the senior project, which will also include a paper. Students will be placed in internships related to their intended field of employment; those who are uncertain will be placed in human services positions. Gigi Fansler, who has been hired as associate dean to direct the program as well as teach, will secure the internship positions. She was previously head of the Illinois State University human resources department. Nutt said several factors led to the decision to offer the baccalaureate program only at the Normal campus. First, the twin cities have more than 10 times as many people to draw from, compared with Lincoln. Second, the area offers many potential part-time faculty members as well as the ambience of a university town. Third, the Normal campus has room for expansion; of the nine acres the college owns, only six have been developed. Finally, Nutt said LC could not afford a junior-senior program without the student services contract it has signed with Illinois State University. According to the terms of this contract, "Lincoln College students are identical to ISU students in everything except where they attend class," he said. They are entitled to use all other student services and facilities, including recreation, library, food service, personal and career counseling, and health services. "They can join fraternities if they want," he said, "or play in the marching band." One employee in Milner Library is the designated contact to work with LC students and faculty to locate any materials they need. Like ISU students, they will have 24-hour Internet access to library sources. The liberal arts degree will comprise 60 hours of credit, 39 in required courses and 21 in electives. Required classes are distributed among communications, critical thinking, humanities, social sciences, ecology and mathematics. A two-year schedule of required courses might include, for example, professional writing, communication theory, techniques of persuasion, comparative economic systems, organizational behavior, research methods, conflict management, finite mathematics and physical anthropology. Of the 60-hour total, 40 hours must be at the junior-senior level, with course numbers in the 300s and 400s. Sixteen upper-level courses of three hours each are planned for the fall semester. To meet the needs of working adults, late afternoon, evening and Saturday courses will be offered. 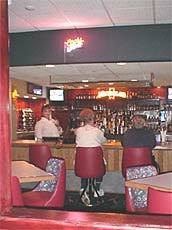 [APRIL 20, 2001] The Tropics Steak & Pasta House at 1007 Hickory Drive, on historic Route 66, has been open under the management of Tim Dalipi for two weeks, serving a mixed menu of Italian and American dishes. Five members of the Dalipi family are involved in the operation of the restaurant. Sam Dalipi ran former restaurants in Chicago, Peoria, Champaign and Sullivan, but says he now just works for his son Tim. Sam’s brother Jim is chef, Tim’s sister Rita is hostess and his brother Tefik works in back. In addition, the restaurant employs about 20 waitresses and three bartenders. Sam Dalipi was born in Albania, and the special Wednesday night was chicken Albanese, made with broccoli, red pepper, artichokes and herbs and sautéed in white wine. Italian dishes such as the house special pasta combination of manicotti, meat lasagna and cannelloni are featured on the menu. There is even a dessert called chocolate lasagna, consisting of layered chocolate cake, cream and chocolate morsels. When asked to differentiate between Italian and Albanian cuisine, both Tim and Sam Dalipi said the two are virtually identical. The Tropics’ menu offers variety in every category. A few examples are calamari and stuffed mushrooms for appetizers; spinach, princess and julienne salads; French dip and Italian beef sandwiches; chicken Piccante, Sorentino, Francaise and Scarpariella; several cuts of steak and seafood choices; and cheesecake and tiramisu for dessert. A separate lunch menu will be available starting Monday, April 23. Tim Dalipi said it will offer a wide variety, from sandwiches to steak, and will include specials, as does the evening menu. The restaurant is open 11 a.m. to 10 p.m. Sunday through Thursday and 11 a.m. to 11 p.m. Friday and Saturday. Entrees on the regular menu range in price from about $6 to $15. The kitchen of the restaurant follows the same design as formerly but has been furnished with totally new equipment. Broilers, grills, stoves, fryers, coolers, steam tables, pots and pans — "from dishes to floor mats, everything is new," Sam Dalipi said. 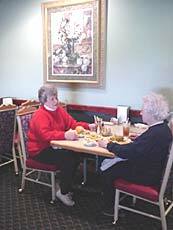 The former coffee shop is now the dining room for smokers, and the two dining rooms are newly furnished. 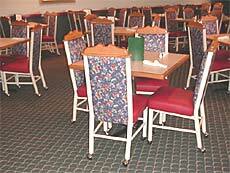 Carpeting is green, and chairs sport a green and red paisley print on blue with red trim. New wall art features florals and Italian scenes. However, in addition to updating the look of the restaurant, the Dalipis have retained a bit of The Tropics of the past. The tropical island mural long associated with the restaurant still graces one wall, and Tim Dalipi said Lew Johnson is bringing back some of the paintings that were previously displayed. Two Route 66 signs remind diners of the location on that historic highway. One change to the bar area is that windows have been cut in the wall so the interior can be seen from the hall and from the dining room for smokers. The L-shaped bar is still there, but wood trim has been added. Tim Dalipi expresses pride in how the bar turned out. A full wall now separates the banquet area from the regular dining room. Entrance to the banquet rooms is from the west, near the tropical island mural. The banquet area can be made into one or two rooms and can seat 25 to 150. Refurbishment so far includes repainting and replacement of ceiling tile. The area will open in approximately a month, after new carpet and furniture are in place. Tim Dalipi said the entire restaurant can accommodate 220 people. The changes have somewhat reduced capacity. "Business is doing real well, and people have been great," he said. He describes The Tropics as a family restaurant and offers a children’s menu of several items. The family began working on the restaurant last summer, but the lease officially began in December 2000, according to Tim Dalipi. He said one plan for the future is to redesign outside signs to update the exterior look of the restaurant. The new e-mail address is ietc@abelink.com. Phone and fax numbers remain the same: phone (217) 735-5441 and fax (217) 732-2658. Staff members are Fred Wiemer, Rod Lewis and Jan Gleason. Please feel free to contact any of the staff for employment and training services. 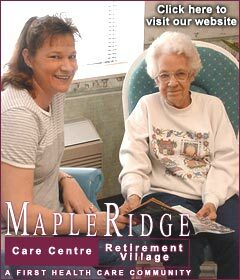 The staff looks forward to serving you. May 17 — Chamber mixer, Gossett’s/7th Heaven, 311 Broadway St. The Chamber of Commerce is a catalyst for community progress, bringing business and professional people together to work for the common good of Lincoln and Logan County. 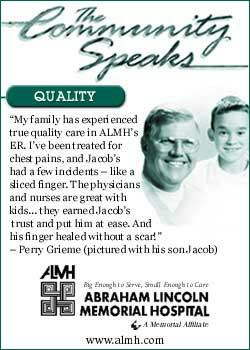 [APRIL 19, 2001] Congratulations to James Rusk, who has been named Abraham Lincoln Memorial Hospital April Employee of the Month. He has worked in the dietary department at ALMH since 1998. Rusk’s nominators state that he "is very compassionate with the patients and their needs. He’s willing to lend a hand without even asking for his help—he just jumps right in. James does a great job and you can always count on him to follow up on things." Rusk was born and raised in Bloomington and currently resides in Lincoln. He enjoys spending time with his family, and he also enjoys cooking. [MAY 3, 2001] Meet Mayor Beth Davis at Main Street Lincoln’s Mornings on Main event Tuesday, May 8, at 7:30 a.m. You are invited to join in coffee and conversation at Sam Sorrento’s Ristorante, 521 Broadway. This is an opportunity to share your concerns for downtown Lincoln. No RSVP is required, but attendance is appreciated. Historic Preservation Week activities will be May 13-19. Businesses join in the celebration by decorating their windows. • Thursday, May 10, and Friday, May 11 — Illinois Main Street Conference at the Hilton in Springfield. with our new Job Hunt feature in the Business section. Employers, you can list available jobs by e-mailing ldn@lincolndailynews.com. Each job listing costs $10 the first week, $20 for eight days to three months. There is a limit of 75 words per announcement.